On the Earth we rely on gravity, not just to keep our feet on the ground but also to help us to work out things like, ‘Where is the ground?’; ‘Which way is up?’; ‘Where are my arms and legs?’. Without the effect of gravity to act as a signal, the weightlessness of space can be a very confusing place to find your feet. We use a network of fluid-filled channels to help us keep our balance. This network is called the vestibular system and is found inside the inner-ear. It identifies the pull of gravity and relays this information to the brain. Without gravity, the vestibular system can’t relay all the necessary information that an astronaut would normally rely on to tell which way is up and which way is down. Astronauts can feel very disortientated when they first arrive on the International Space Station. This can be particularly disorientating when astronauts first arrive in space and can cause nausea similar to the motion-sickness or travel-sickness that some of us experience on Earth. We get travel-sick when our balance sensors send information to the brain which doesn’t agree with what our eyes are telling us. The brain gets confused as to how to interpret these signals and it can be very funny to watch people when this is happening to them, such as when they are walking on the deck of a moving ship or when they have just stepped off a roundabout in the park. You can get a sense of what astronauts might feel when they first arrive at the ISS by playing this game of disorientation football in the park or garden. It’s a fun way to get some idea of what it feels like to be disorientated in space. If you can manage to score a goal, you’re probably not doing it properly! Make sure you do this mission outside in a wide open space - preferably on grass! Place one football on the ground about 6m away from the goal. Make sure it is central to the goal mouth. Then, place the second football on the ground another 6m further from the goal, and in line with the first one. Now put one hand on the second ball and, keeping your eyes on the ball, run around it 13 times. Ask your friends to keep count. Now run towards the first ball and try to score a goal. You may feel dizzy but you regain your balance after a few minutes, when your vestibular system adjusts. 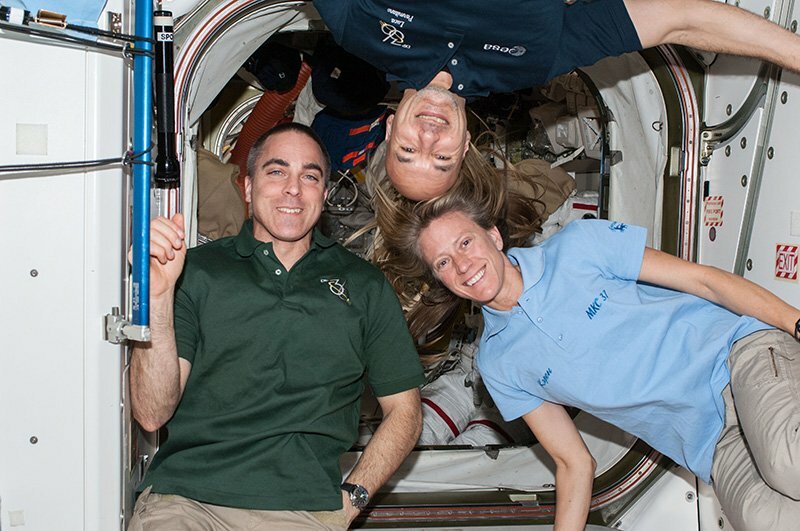 Just imagine how disorientated Tim Peake and other astronauts might feel on the ISS. It takes a lot longer than a few minutes for their vestibular system to adjust; it takes several days! Look at how dizzy these professional footballers are after running round a football a few times.